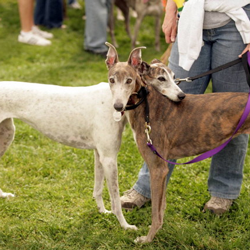 Greyhounds on the track often have only 2-3% body fat. Even at pet weight in our homes, they have a much higher percentage of muscle than the average dog. Muscle absorbs toxins more easily than fat does. 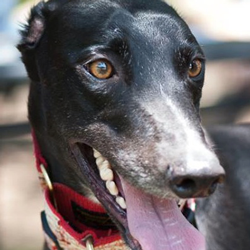 That is one reason why Greyhounds are more sensitive to anesthesia and other medications. That also means that they are more sensitive to poisons in our homes. It’s important to “puppy proof” your home in much the same way you would childproof your home when a toddler is present. Becoming familiar with the following could save your dog’s life. 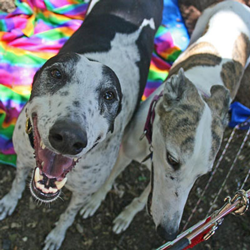 Also read these first hand experiences from GreySave owners who have had their Greyhounds get into poisonous substances. 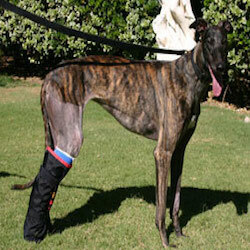 See related information on our Gardens and Greyhounds page. PetEducation.com has a section on ﻿Dog First Aid t﻿hat discusses what to do if your dog should ingest a wide variety of toxic substances. 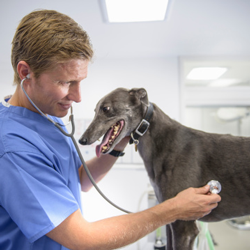 This website offers a lot of information and advice: What to do if your animal has been poisoned. Nutrition experts at the ASPCA have put together a handy list of the top toxic people foods to avoid feeding your pet. As always, if you suspect your pet has eaten any of the following foods, please note the amount ingested and contact your veterinarian immediately. You can call the groups below for help if you think your dog has encountered a poison. Note the charges for your calls. The telephone number is (888) 426-4435. There is a $65 consultation fee for this service. 1-900-680-0000. $45 per case, billed to your phone. NAPCC notes: "A dog is not a 4-legged human. The NAPCC staff is all veterinary health professionals who have been trained in animal toxicology. 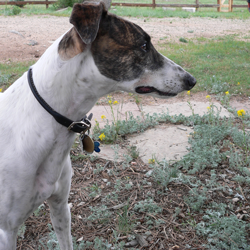 Because of their training, they are prepared to deal with the complexities of a poisoned dog. 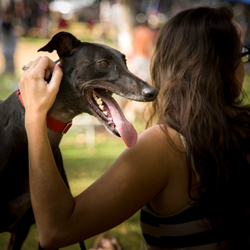 Assistance is provided to both veterinarians and pet owners. The center is staffed around the clock by veterinary professionals. In the case of certain chemical exposures, the manufacture of the chemical/product may pay the caller's NAPCC charges. NAPCC will make follow-up call(s) as needed. Watch for any changes in color (skin and in mouth) and respiration, excessive salivation or dryness, diarrhea, heaving, vomiting, extreme restlessness or lethargy. Do NOT try to induce vomiting or ingestion without first consulting a veterinarian or poison control center." Pawing at the ears (indicates a ringing sound), eyes, or mouth. Watering eyes and/or nose. Increased thirst and salivation frequent swallowing. Dry mouth, numbness of tissues or pale tissues, dilated pupils, blurred vision (bumping into objects). Breathing: difficult or labored; change in respiration rate such as reduced, rapid, irregular, shallow or very deep. Nervous system: shivering, unusual and uncoordinated movements, shock, coma, paralysis, convulsions. Urinary tract: increased urination, blood in urine, increased or reduced volume, pain or urination. If you know what your dog ingested (it should be listed on the container), take it with you to the vet. Call your vet to say that you will be bringing your dog in. He or she may want to contact the poison center for more information. Bring in a zip-lock bag anything your dog has vomited or chewed. 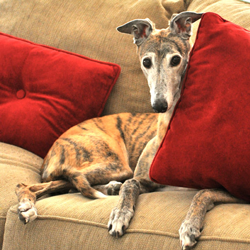 Before leaving for the vet it may be necessary to begin treatment at home, but call the vet first to get instructions. To purge poison you induce vomiting. Use hydrogen peroxide, 3% soluttion. Never use syrup of Ipecac, which can be toxic to pets. However, never induce vomiting if a caustic substance (such as bleach or pool treatment acid) was swallowed. Caustic poisons need to be neutralized. If an acidic poison (like bleach) has been ingested, Milk of Magnesia can be given or activated charcoal. If an alkaline poison has been ingested, vinegar or lemon juice is needed. Sometimes you can dilute the poison by giving your dog milk to drink. Cocoa mulch – highly toxic to dogs. Cocoa bean shell mulch products have an attractive odor and smell. Some dogs will eat large amounts of the mulch. 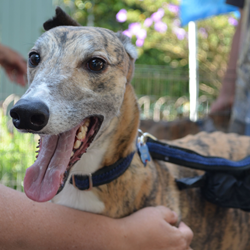 Pesticides –not safe for greyhounds. 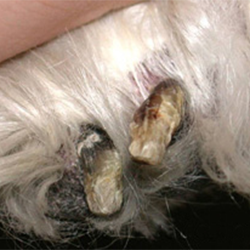 Snail bait is very enticing to dogs, looks like kibble, and is a common poison problem seen at veterinary offices. See the article on Snail bait and Jake, Our "Forever Great"
Plants with thorns or spikes - palms, roses, bougainvillea, cactus plants. Keep these fenced off or pruned well to prevent injury.